The beauty of a dropship store is the fact that it enables you to provide your customers with the very best products, carefully sourced from across the globe. But providing customers with the opportunity to purchase items from vendors spanning different continents can soon cause headaches when it comes to shipping rates. 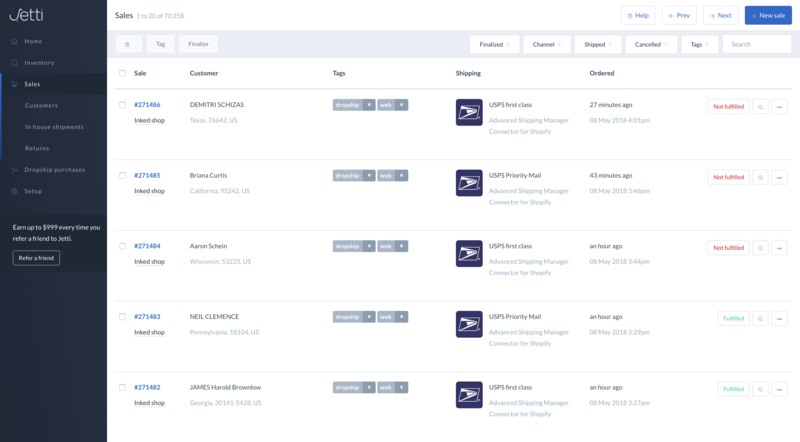 Jetti enables you to finely tune your store’s shipping rates, making the whole process a whole lot easier. Set different shipping rates for different vendors and automatically pay vendors for shipping. With Jetti, you can even combine your vendor’s shipping rates to charge your customers one consolidated sum for shipping when they reach the checkout. Jetti integrates with different shipping carriers, enabling you to automatically generate rates, or setup your own shipping rates manually.